The talented saa paper artisans of Thailand present a beautiful set of handcrafted handbags. 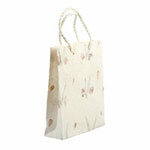 The bags and handles are made with sustainable saa (mulberry tree) paper. 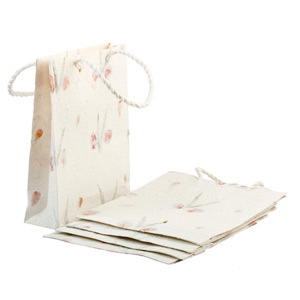 The bags are decorated with dried bougainvillea petals and dried bamboo leaves. Bag (each): 28.0 cm W x 32.5 cm H x 8.0 cm D.
Handle: 1.0 cm Diam x 39.0 cm L.
Materials: Mulberry paper, bougainvillaea petals and bamboo leaves.